Edge Ware Identification of Antique Ceramics | Bardith, Ltd.
Use this edge ware identification guide to identify and date antique ceramics. Combining edge colors and rim shapes will give an approximate date range; this guide is by no means an authentication source but provides date information based on known examples. See the References section at the end to explore two very reliable ceramics identification sources. 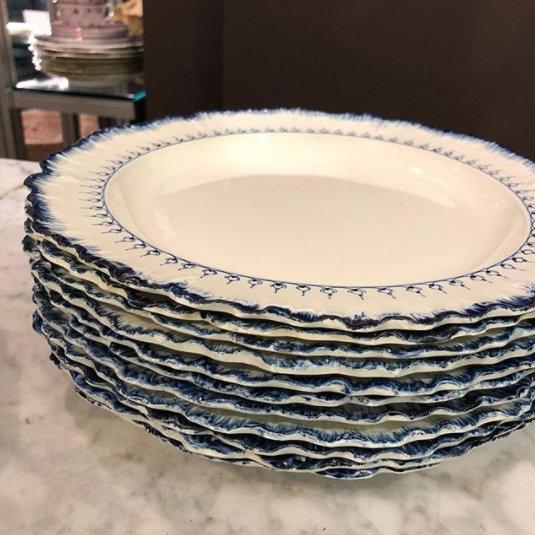 Edged wares simply refer to ceramics (typically refined white earthenwares like creamware and pearlware) that have a decorative motif(s) around their rim edges. Such decorations can be molded/incised, painted/glazed, or a combination of those techniques. The most common rim colors are blue and green, though rarer colors like purple, green, red, black, and brown are known to exist. Edged ware exists almost exclusively in English pottery. Josiah Wedgwood was one of the first documented potters to introduce edge designs, doing so on creamware in the mid 1770s. Soon, other factories and potters noted his success and began producing edged wares of their own. Edged wares became popular as a cheaper alternative for extremely ornamented tableware. Their popularity peaked during the rather lengthy period of 1790-1860 in England and America. To identify edge ware, one must examine both the color and molded decorations. Color on edged wares can be painted under- or overglaze. Blue and green are the most prevalent colors. Overglaze enamels in other colors also exist, though these are usually earlier and more rare. Ceramics can be in the Rococo, Neoclassical, or Victorian styles (see molded rim techniques below for further identification assistance). Rococo: asymmetric, undulating scalloped rim. Above images from Diagnostic Artifacts in Maryland [JefPat]. Today, edged wares make a wonderful table setting. Combine these with a patterned top plate for a “wow” effect! Digital Archaeological Archive of Comparative Slavery [DAACS]. Are you a fan of edged ware? Shop our collection below.